Whether LSU’s 9-6 overtime victory over Alabama on Saturday night qualified as the “Game of the Century” is very much in the eye of the beholder, but what is certain is that the game was intense, physical, and the stakes couldn’t have been any higher. And it is true that the quarterback play in the game was hardly one for the record books, though the defenses on the field had more than a little something to do with that. Indeed, the Tigers managed to win the game despite recording only 239 yards of total offense. LSU even benched starting quarterback Jarrett Lee in favor of Jordan Jefferson, after Lee threw two costly interceptions. 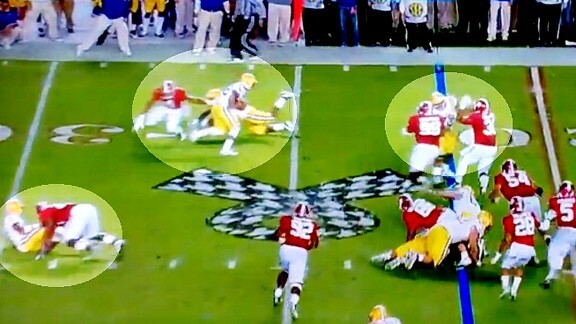 But the change was as much about the Alabama defense as it was about Lee’s play. 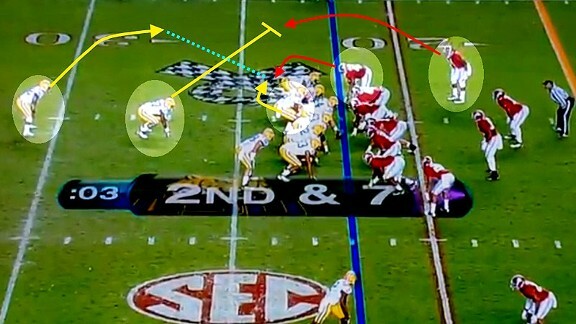 LSU’s preferred method of attack is to use pro-style power plays from traditional formations. But Alabama, which already has a magnificent set of front seven defenders, stacked the box, leaving little running room. If the defense is going to play numbers against your running game, it really leaves you two options: Either you throw the ball to get them to back out of it, or you use the quarterback in the run game. This evens out the numbers, as your quarterback can “block” a defender by being a run threat. Football is governed as much by arithmetic as it is by physics. The best and most crucial example of the speed option in the game came in overtime. The play-by-play simply refers to it as a 15-yard rush by Michael Ford, but the play essentially ended the game, as Alabama had just missed a field goal and, after the run, LSU’s field goal — and thus its victory — became inevitable. 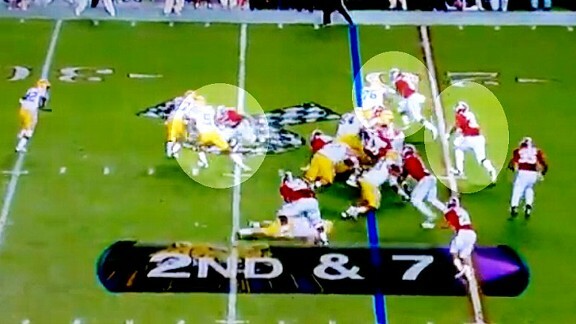 On this play, LSU showed a particularly interesting wrinkle. Not only did it run the speed option, it actually lined up in an unbalanced formation, and then ran away from the extra blockers. As can be seen from the image above, LSU put the tight end, H-back (a tight end lined up off the line), and a wide receiver all to the right side of the formation. 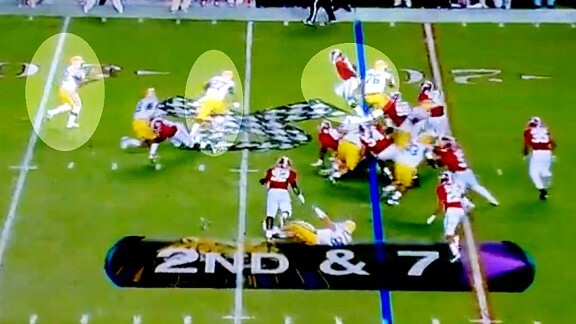 To the left, the Tigers had only the offensive guard and the tackle. Alabama’s adjustment was to overload the offense’s right side to the point that it was undermanned to the weak side. The defensive end is left unblocked, as that is who Jefferson is optioning. 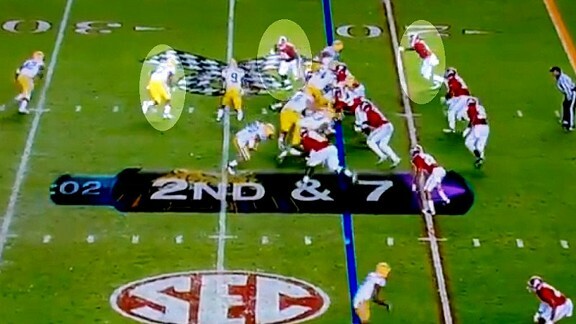 You can also see the outside defender to that side begin to attack swiftly to the outside, as his job is to take Ford, who is the “pitch back.” Additionally, there is an inside linebacker tracking downhill for the runners; as we’ll see, LSU’s tackle, Chris Faulk, is able to pin him back and seal the inside. At this point, it’s already clear that the play has a great chance of success: The end, who quite possibly should have been on a search-and-destroy mission to hit the fullback, zooms at the quarterback, forcing the quick pitch. As a result, while there is a defender whose job it is to take the running back, there’s also a blocker assigned to him. This is why option football works, and why anyone who says all you have to do is play “assignment football” is fooling themselves. That’s certainly part of it, but never forget that the offense can figure out what your assignments are and block the guy you think you’ve got covering one of the options, exactly as happens here. Jefferson has now pitched it and the only question is whether the blocks will be effective; the scheme has worked. The key block is by the fullback, running back Kenny Hilliard, who the prior week scored two touchdowns against Auburn. On this play his role was less glamorous but no less important. If he gets a block — any block — on the defender coming down, it’s a huge play. The blocks, under the circumstances at least, couldn’t have been any better. Hilliard is forced to dive to make a block but it’s enough to get the defender out of the way. And Faulk has managed to pin two defenders inside. And, like all great option plays, the quarterback is on the ground with a defender over him, thinking he’d made quite the play. Instead, LSU was off to the races.